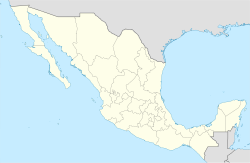 Escárcega (Spanish pronunciation: [esˈkaɾseɣa]) is a small city in the Mexican state of Campeche, located at 18°37′N 90°44′W﻿ / ﻿18.62°N 90.74°W﻿ / 18.62; -90.74 in the central part of the state. As of 2010, the city of Escárcega had a population of 29,477. ^ a b "Escárcega". 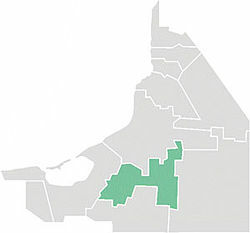 Catálogo de Localidades. Secretaría de Desarrollo Social (SEDESOL). Retrieved 23 April 2014. ^ "Estado de Campeche–Estacion: Escárcega (SMN)". NORMALES CLIMATOLÓGICAS 1951–2010 (in Spanish). Servicio Meteorológico National. Retrieved 12 May 2015. ^ "Extreme Temperatures and Precipitation for Escárcega (SMN) 1943–2009" (in Spanish). Servicio Meteorológico Nacional. Retrieved 12 May 2015.